We just can’t get enough of the video for Jessy Lanza’s recent “Kathy Lee”. 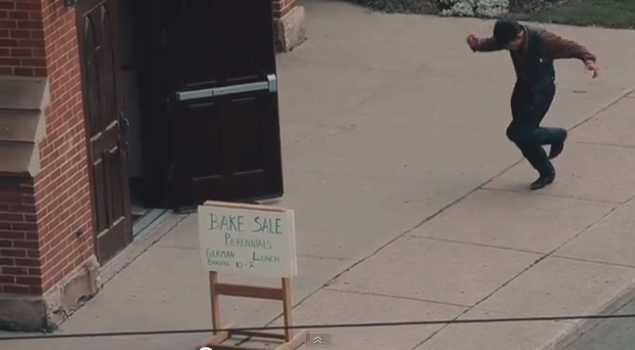 The video features mundane street scenes of Hamilton, Ontario as a backdrop for the mysterious Dancing Guy, Jed, to do his thing. As you’ll see, the location is as much the star as the dancing man appears to be. You continually anticipate something remarkable happening only to be offered more scenes of Jed dancing with himself. Spoiler alert: nothing does happen. The video is totally anticlimactic, but somehow still hypnotic and irresistible. Taken from her recent Hyperdub release, “Pull My Hair Back” —a collaboration with Junior Boys’ Jeremy Greenspan—the track is essentially the product of an IDM/techno nerd’s fascination with R&B. We mean that in the best possible way, of course, but it’s true—the songs can be both awkward and smooth, glitchy but still funky. If you’re familiar with Junior Boys, then you’ll surely appreciate this weird mix of chilly electronics and warm R&B grooves. It’s a combination that seems odd on paper but meshes really quite well in execution—Lanza’s sultry coo and lonely synth smoothing out the glitchy edges that click, pop and hiss. If your average Tiger-Cat fan is this cool and dudes dance in the streets at random, then we’re booking our flights to YHM tomorrow. For a springtime visit, of course.